Being 30 at the time of completing a doctoral programme is common even in advanced countries. 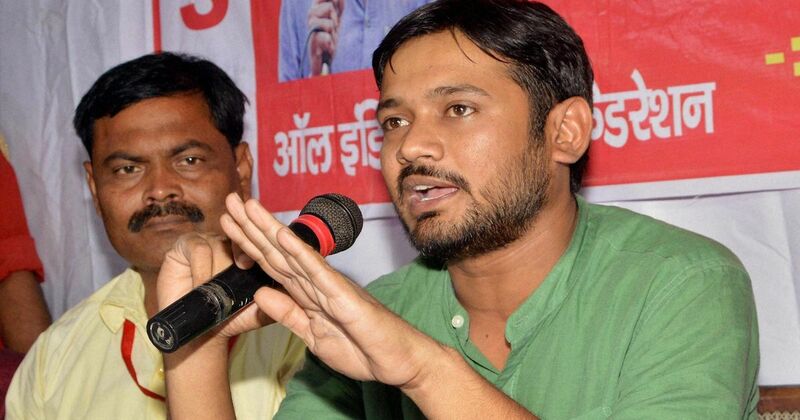 Kanhaiya Kumar was the president of the Jawaharlal Nehru University Students Union in 2015-'16, when he was a PhD scholar at the varsity. 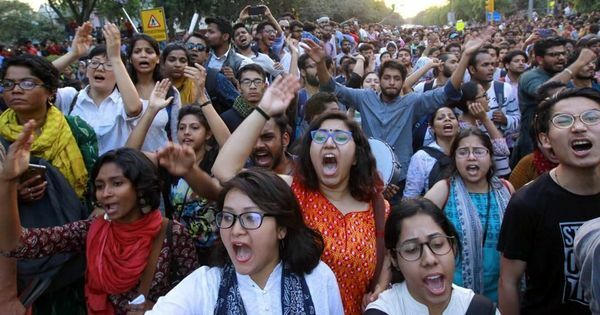 Every time protests erupt at Jawaharlal Nehru University, fingers are pointed at the age of its students, especially their leaders. Its research scholars are routinely berated on social media for being students even in their late 20s and early 30s. But analyses of trends in other countries, including the United States, show that Jawaharlal Nehru University’s students are not too old to still be enrolled in an educational institution. Barring a few language courses, the varsity is entirely a post-graduate institution with most schools and departments offering only master’s and research programmes. Its student leaders come from an older cohort and every president of its students’ union since 2012 has been a PhD scholar, typically from a social science background. There is no classroom teaching for them but independent research supervised by faculty members whom they meet only when they need to. As statistics on age and level of study in some of the most developed countries show, being in the late 20s or early 30s when completing a doctoral research programme is, in fact, the norm. According to the Organisation for Economic Co-operation and Development’s 2017 report, Education at a Glance, the typical age for completing a doctoral or equivalent programme crosses 30 in most countries. In some, such as Finland, the “typical age” is 30 years to 37 years and in Australia, it is 26 years to 35 years. In countries where the typical age at completion is significantly higher than in others, the age of entry into research is also higher, suggesting that students left academics at some point to join the workforce but resumed their studies later. 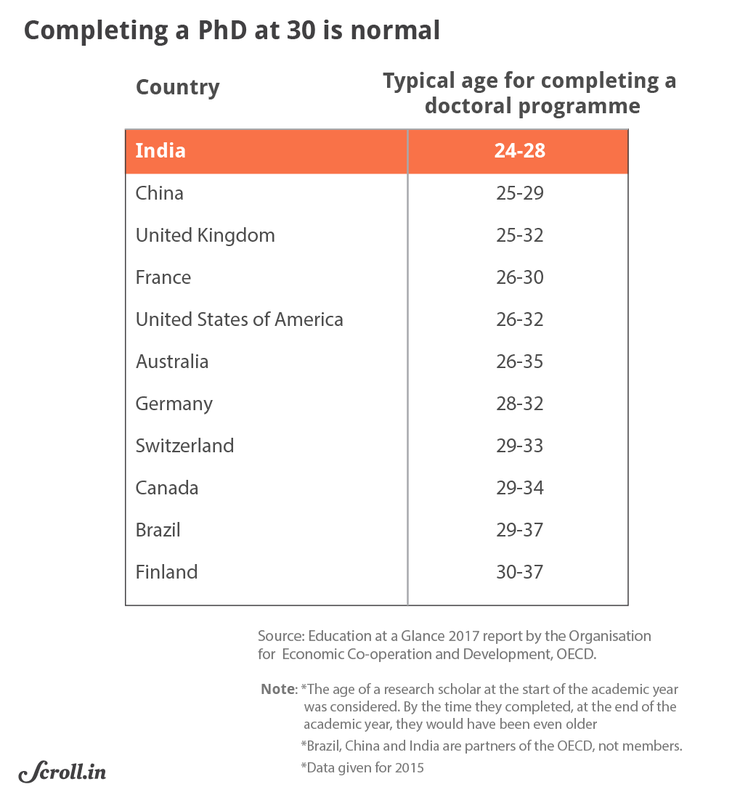 India’s typical age range for completing a doctoral programme, while consistent with trends in several developing countries, is lower than that of many advanced ones. 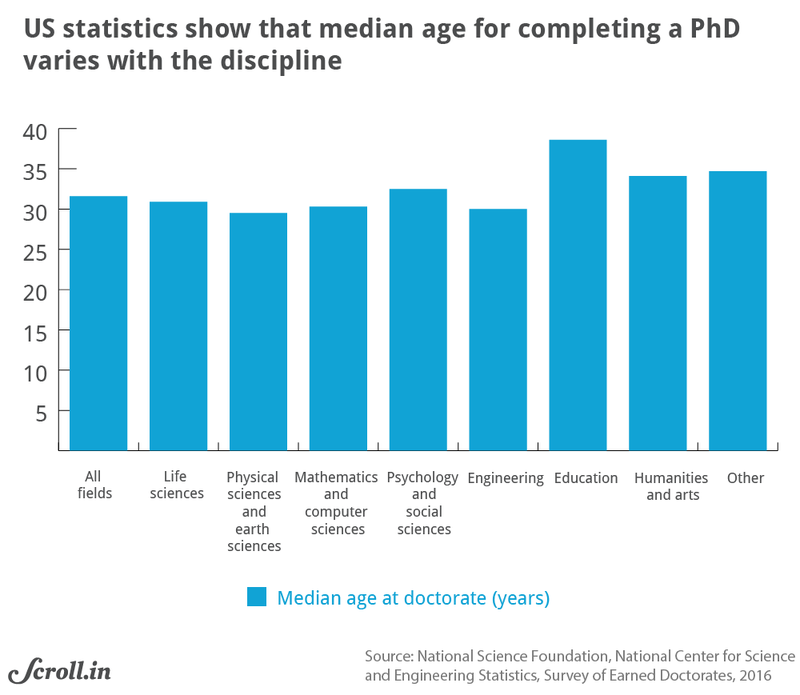 Similarly, statistics gathered in 2016 by the National Science Foundation for scholars based in the US show that the median age for completing a doctoral programme varies widely with the field of study. In the case of physical and earth sciences, 65.5% researchers who completed their PhDs in 2016 – the highest proportion – were in the 26-30 age group. Close to 60% of engineering PhDs were in the same age-group. But in the case of the humanities and arts, most scholars – 42% – to complete their research programmes were in the 31-35 age-group. The section of researchers to complete their programmes while they are still under the age of 25 is less than 2% in all fields. 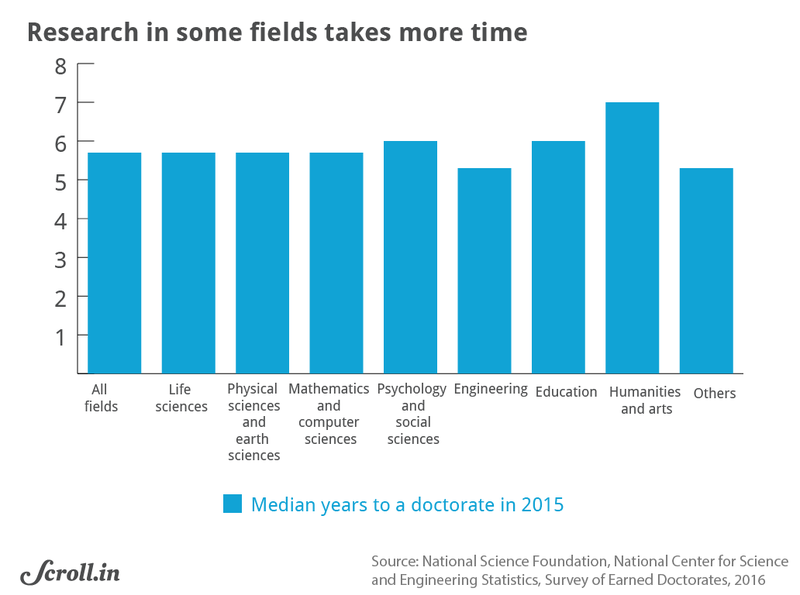 The National Science Foundation’s Survey of Earned Doctorates also shows that research in humanities, social sciences and education takes longer than in the science and engineering streams. The American Academy of Arts and Sciences’ Humanities Indicators project analysed trends over two decades – 1994 to 2014 – and found that while “the median age of new doctoral degree recipients in all fields declined more than 7% (a 2.5-year decline from 34.1 to 31.6),” in the humanities, “the median age fell 4%, (a 1.5-year decline from 35.7 to 34.2)”. The project’s analysis also pointed out that humanities and social science students take longer at the dissertation stage than their counterparts in the sciences. The analysis also notes that while researchers in every field now take less time on a doctoral course than they did in the early 2000s, the decline in the case of humanities has been much slower and that “in recent years, reformers in the humanities have focused on decreasing time-to-degree while preparing graduates for an array of career options beyond academia”.